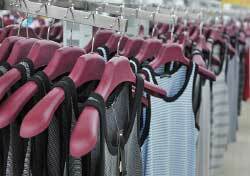 A quick stroll through most any retail store will reveal a substantial investment in inventory. Even if a merchant is selling goods at a healthy profit, financial difficulties can creep up if a large part of the inventory remains unsold for a long period of time. Goods go out of style, become obsolete, and so forth. Therefore, a prudent business manager will pay very close attention to inventory content and level. 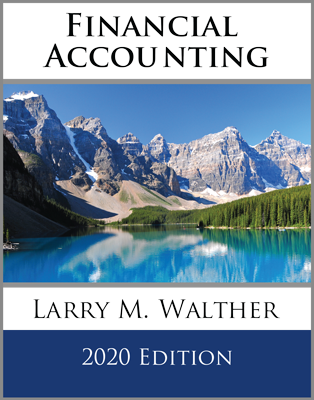 There are many detailed accounting issues that pertain to inventory, and a separate chapter is devoted exclusively to inventory issues. This chapter’s introduction is brief, focusing on elements of measurement that are unique to the merchant’s accounting for the basic cost of goods. The first phase of the merchandising cycle occurs when the merchant acquires goods to be stocked for resale to customers. The appropriate accounting for this action requires the recording of the purchase. There are two different techniques for recording the purchase; a periodic system or a perpetual system. Generally, the periodic inventory system is easier to implement but is less robust than the “real-time” tracking available under a perpetual system. Conversely, the perpetual inventory system involves more constant data update and is a far superior business management tool. The following presentation begins with a close examination of the periodic system. Later in the chapter the perpetual system will be described. Purchase returns and allowances are subtracted from purchases to calculate the amount of net purchases for a period. The specific calculation of net purchases will be demonstrated after a few more concepts are introduced. While discounts may seem slight, they can represent substantial savings and should usually be taken. 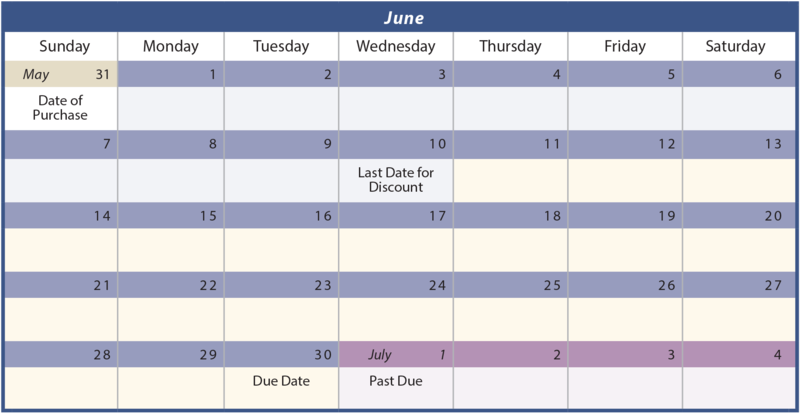 Consider the following calendar, assuming a purchase was made on May 31, terms 2/10, n/30. The discount can be taken if payment is made within the “blue shaded” days. The discount cannot be taken during the “yellow shaded” days (of which there are twenty). The bill becomes past due during the “purple shaded” days. What is important to note here is that skipping past the discount period will only achieve a twenty-day deferral of the payment. Consider that a 2% return is “earned” by paying 20 days early. This is indeed a large savings. There are approximately 18 twenty-day periods in a year (365/20), and, at 2% per twenty-day period, this equates to over a 36% annual interest rate equivalent. A business should set up its accounting system to timely process, and take advantage of, all reasonable discounts. In a small business setting, this might entail using a system where invoices are filed for payment to match the discount dates. A larger company will usually have an automated payment system where checks are scheduled to process concurrent with invoice discount dates. Very large payments, and global payments, are frequently processed as “wire transfers.” This method enables the purchaser to retain use of funds (and the ability to generate investment income on those funds) until the very last minute. This is considered to be a good business practice. Many vendors will accept a “discounted payment” outside of the discount period. In other words, a purchaser might wait 30, 60, or 90 days and still take the discount! Some vendors are glad to receive the payment and will still grant credit for the discount. Others will return the payment and insist on the full amount due. Is it a good business practice to “bend the terms” of the agreement to take a discount when the supplier will stand for this practice? Is it ethical to “bend the terms” of the agreement? Are these two questions really one and the same? Rather than recording purchases under the gross method, a company may elect to record the purchase and payment under a net method. With this technique, the initial purchase is again recorded by debiting Purchases and crediting Accounts Payable. However, the amount of the entry is for the invoice amount of the purchase, less the anticipated discount. Assuming the company intends to take the discount, this entry results in recording the net anticipated payment into the accounts. In evaluating the gross and net methods, notice that the Purchase Discounts Lost account (used only with the net method) indicates the total amount of discounts missed during a particular period. The presence of this account draws attention to the fact that discounts are not being taken, frequently an unfavorable situation. The Purchase Discounts account (used only with the gross method) identifies the amount of discounts taken, but does not indicate discounts missed, if any. For reporting purposes, purchases discounts are subtracted from purchases to arrive at net purchases, while purchases discounts lost are recorded as an expense following the gross profit number for a particular period. The following illustration contrasts the gross and net methods for a case where the discount is taken. Notice that $4,900 is accounted for under each method. The gross method reports the $5,000 gross purchase, less the applicable discount. In contrast, the net method only shows the $4,900 purchase amount. The next illustration contrasts the gross and net methods for the case where the discount is lost. Notice that $5,000 is accounted for under each method. The gross method simply reports the $5,000 gross purchase, without any discount. In contrast, the net method shows purchases of $4,900 and an additional $100 expense pertaining to lost discounts. 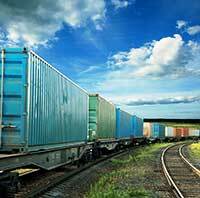 A potentially significant inventory-related cost pertains to freight. The importance of considering this cost in any business transaction is critical. The globalization of commerce, rising energy costs, and the increasing use of overnight delivery via more expensive air transportation all contribute to high freight costs. Freight costs can easily exceed 10% of the value of a transaction. As a result, business negotiations relate not only to matters of product cost, but must also include consideration of freight terms. Freight agreements are often described by abbreviations that describe the place of delivery, when the risk of loss shifts from the seller to the buyer, and who is to be responsible for the cost of shipping. One very popular abbreviation is F.O.B., which stands for “free on board.” Its historical origin related to a seller’s duty to place goods on a shipping vessel without charge to the buyer. International commercial terms (“incoterms”) and abbreviations (e.g., FCA, DDU, etc.) have been developed by the International Chamber of Commerce. As a result, great care should be taken to understand the specific nature of various freight agreements that occur in global commerce. In the U.S., the F.O.B. point is normally understood to represent the place where ownership of goods transfers. Along with shifting ownership comes the responsibility for the purchaser to assume the risk of loss, pay for the goods, and pay freight costs beyond the F.O.B. point. In the illustration at left, notice that money is paid by the seller to the transport company. This is the case where the terms called for F.O.B. Destination — the seller had to get the goods to the destination. This situation reverses in the next illustration: F.O.B. Shipping Point — the buyer had to pay to get the goods delivered. The third illustration calls for the buyer to bear the freight cost (F.O.B. Shipping Point). However, the cost is prepaid by the seller as an accommodation. 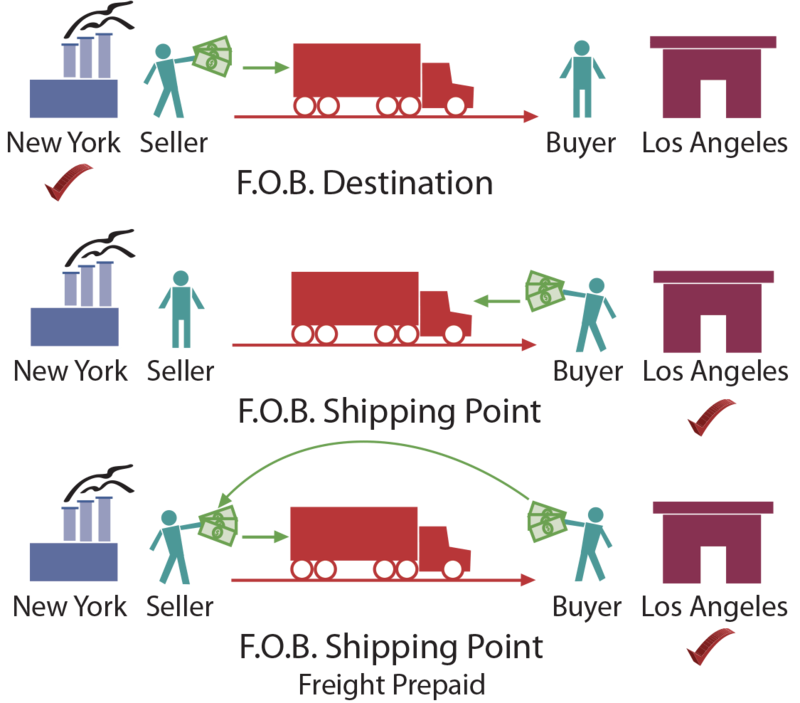 Notice that the buyer then sends payment to the seller to reimburse for the prepaid freight; ultimately the buyer is still bearing the freight cost. Of course, other scenarios are possible. For example, terms could be F.O.B. St. Louis, in which case the seller would pay to get the goods from New York to St. Louis, and the buyer would pay to bring the goods from St. Louis to Los Angeles. Take a moment and look at the invoice presented earlier in this chapter for Barber Shop Supply. Notice that the seller was in Chicago and the purchaser was in Dallas. Just to the right of the invoice date, note that the terms were F.O.B. Dallas. This means that Barber Shop Supply is responsible for getting the goods to the customer in Dallas. That is why the invoice included $0 for freight; the purchaser was not responsible for the freight cost. Had the terms been F.O.B. Chicago, then Hair Port Landing would have to bear the freight cost. Next are presented appropriate journal entries to deal with alternative scenarios. If goods are sold F.O.B. destination, the seller is responsible for costs incurred in moving the goods to their destination. Freight cost incurred by the seller is called freight-out and is reported as a selling expense that is subtracted from gross profit in calculating net income. If goods are sold F.O.B. shipping point, freight prepaid, the seller prepays the trucking company as an accommodation to the purchaser. This prepaid freight increases the accounts receivable of the seller. That is, the seller expects payment for the merchandise and a reimbursement for the freight. The purchaser would record this transaction by debiting Purchases for the amount of the purchase, debiting Freight-In for the amount of the freight, and crediting Accounts Payable for the combined amount due to the seller. Cash discounts for prompt payment are not usually available on freight charges. For example, if there was a 2% discount on the above purchase, it would amount to $200 ($10,000 X 2%), NOT $208 ($10,400 X 2%). A number of new accounts have been introduced in this chapter. 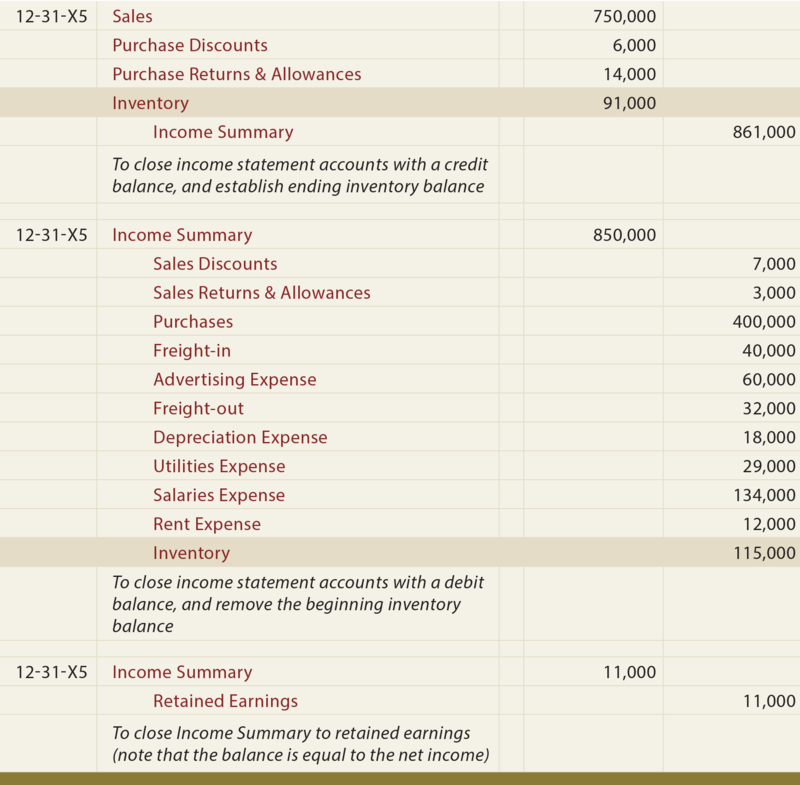 Purchases, Purchase Returns and Allowances, Purchase Discounts, and Freight-in have all been illustrated. Each of these accounts is necessary to calculate the “net purchases” during a period. Assume total purchases of $400,000 during the period. This would be based on the total invoice amount for all goods purchased during the period, as identified from the Purchases account in the ledger. The cost of the purchases is increased for the freight-in costs. Purchase discounts and purchase returns and allowances are subtracted. The result is “net purchases” of $420,000. Net purchases reflect the actual costs that were deemed to be ordinary and necessary to bring the goods to their location for resale to an end customer. Importantly, storage costs, insurance, interest and other similar costs are considered to be period costs that are not attached to the product. Instead, those ongoing costs are simply expensed in the period incurred as operating expenses of the business. The cost of all purchases must ultimately be allocated between cost of goods sold and inventory, depending on the portion of the purchased goods that have been resold to end customers. This allocation must also give consideration to any beginning inventory that was carried over from prior periods. The beginning inventory is equal to the prior year’s ending inventory, as determined by reference to the prior year’s ending balance sheet. 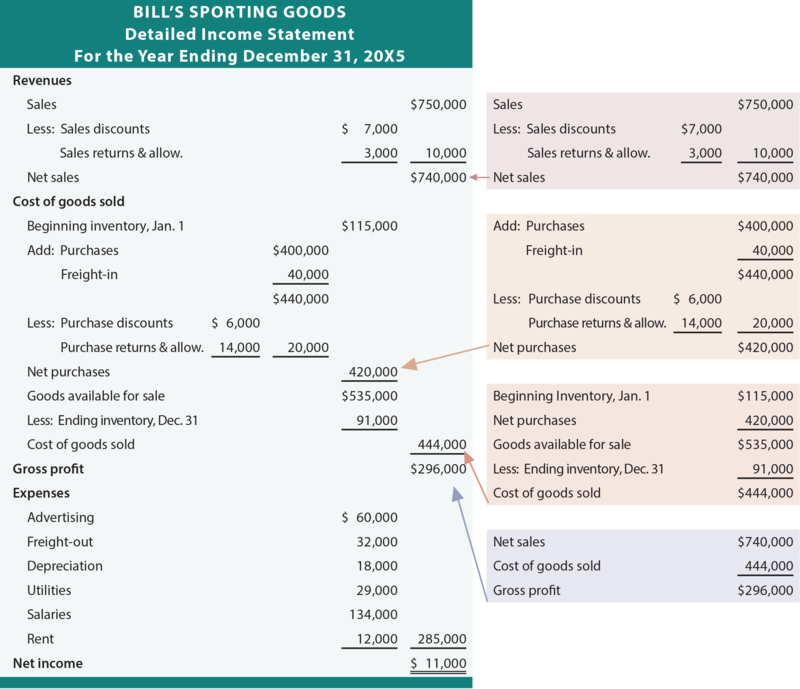 The net purchases is extracted from this year’s ledger (i.e., the balances of Purchases, Freight-in, Purchase Discounts, and Purchase Returns & Allowances). Goods available for sale is the sum of beginning inventory and net purchases. Goods available for sale is not an account, per se; it is merely a defined result from adding two amounts together. The total cost incurred (i.e., cost of goods available for sale) must be “allocated” according to its nature at the end of the year. The cost of goods still held are assigned to inventory (an asset), and the remainder is attributed to cost of goods sold (an expense). There is a lot of activity to consider: net sales, net purchases, cost of sales, gross profit, etc.! A detailed income statement can provide the necessary organization to present all of the data in an understandable format. Study the following detailed income statement. 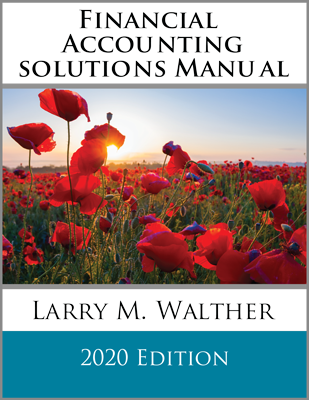 In reviewing the above income statement, be sure to notice (1) the calculation of net sales, (2) the inclusion of details about the calculation of net purchases (including the treatment of freight-in), (3) the calculation of cost of goods sold and presentation of gross profit, and (4) that freight-out is a selling expense included among the various expenses subtracted from gross profit. Be aware that the income statement for a merchandising company may not present all of this detail. Depending on the materiality of the individual line items, it may be sufficient to only present line items for the key elements, like net sales, cost of sales, gross profit, various expense accounts, and net income. Because of all the new income statement-related accounts that were introduced for the merchandising concern, it is helpful to revisit the closing process. 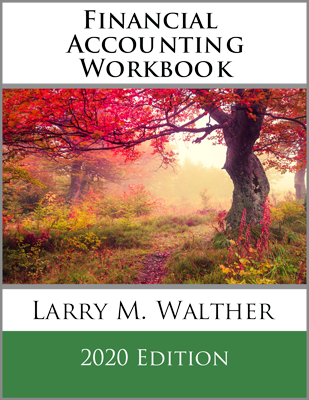 Recall the objective of closing; to transfer the net income to retained earnings and to reset the income statement accounts to zero in preparation for the next accounting period. As a result, all income statement accounts with a credit balance must be debited and vice versa. The closing entries for Bill’s Sporting Goods follow. Several items are highlighted in these journal entries and are discussed further in the next paragraph. These closing entries are a bit more complex than that from the earlier chapter. In particular, note that the closing includes all of the new accounts like purchases, discounts, etc. In addition, it is important to update the inventory records. It may be confusing to see Inventory being debited and credited in the closing process. After all, isn’t Inventory a balance sheet (real) account? And, aren’t the temporary accounts the only ones closed? Why then is Inventory included in the closing? The answer is that Inventory must be updated to reflect the ending balance on hand. Remember that the periodic system resulted in a debit to Purchases, not Inventory. Further, as goods are sold, no entry is made to reduce Inventory. Therefore, the Inventory account would continue to carry the beginning of year balance throughout the year. As a result, Inventory must be updated at the time of closing. These entries accomplish that objective by crediting/removing the beginning balance and debiting/establishing the ending balance. Note that these entries also cause the Income Summary account to be reduced by the cost of sales amount (beginning inventory + net purchases – ending inventory). Distinguish between a periodic and perpetual approach to managing inventories. Understand a Purchases account, and the allocation of purchases to inventory and cost of goods sold. When would a debit memorandum be issued? How are purchase returns and allowances recorded? Develop an appreciation for the economic value of cash discounts. Distinguish between gross and net methods, and how purchase discounts are reported under each. Carefully review freight-related terminology, and describe who must pay and bear the cost of freight. Fully comprehend the calculation of net purchases. What three key amounts enter into the computation of cost of goods sold, and how? How are purchase returns and allowances and purchases discounts presented on the income statement? Have a deep awareness of the form and content of a detailed income statement. Be able to prepare closing entries for a merchandising concern.